The Palona pendant by Tech Lighting flawlessly blends the art of beautiful hand-blown glass and highly engineered mechanical components into one simply stunning pendant light. The Palona perfectly incorporates warm color dimming LED to create an elegant yet dramatic fixture. Customize the Palona pendant to perfectly compliment your desired space by choosing from three modern shade colors and two hardware finishes. Available lamping options include energy efficient LED or no-lamp, leaving you the option to light this fixture with your preferred lamping. 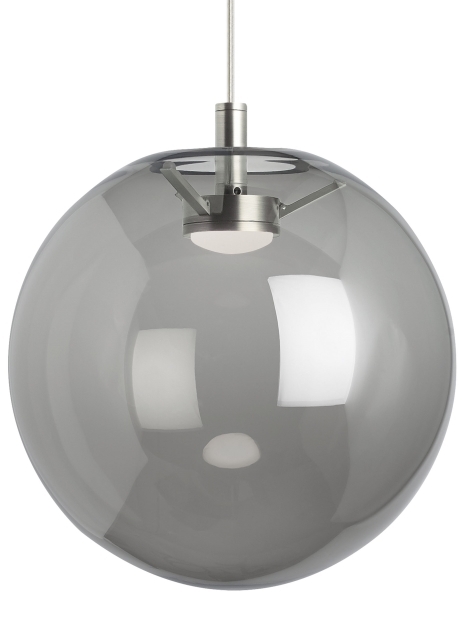 Due to its larger scale the Palona is ideal for kitchen island task lighting, bedroom lighting or home office lighting as well as countless commercial application spaces. Rated for (1) 60 watt max, E26 medium based lamp (Lamp Not Included). Clear & Smoke Glass. LED version includes 120 volt 9 watt, 684 lumen, 3000K-2200K warm color dimming LED module or 3.5 watt, 250 delivered lumen 2700K, medium base LED Squirrel Cage lamp. White Glass. LED version includes 9.5 watt, 800 delivered lumen, 2700K, medium base LED A19 lamp. Fixture provided with six feet of field-cuttable cable. Dimmable with most LED compatible ELV and TRIAC dimmers.